Unique design injects a social element, and builds a network with a google map to find things.We all know that normal anti-loss will be invalid when it travels over a certain distance range between mobile devices.But this tracker allows the owner to report the information of missing items through the App to the server,so that all users who have installed this app could automatically help find it. Build-in Google map to search for your lost item! The main function is anti-theft or anti loss for your items. 1. Find keys, bags and other valuable items & a missing reminder. 2. Run App in IOS5 or Android 4.3 or newer, the device will beep till you find the lost item after you touch the find me icon in service ready status. 3. 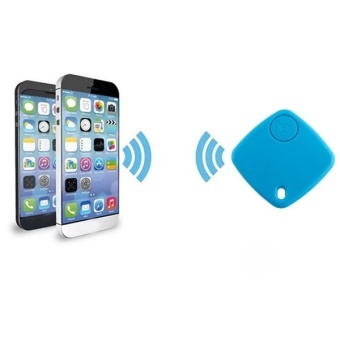 Put the device in your bag, when the mobile phone and bag move out of a specified range, both the mobile phone and the device will beep to alert you. Mobile phones can have different sounds and vibrations to remind you. How many times have you spent precious time looking for your phone, wallet, bag or your pet, yet they are all so easy to misplace. Open the APP on your phone and “call” the tracker to flash or alarm, you can easily find them. Forgot where you the put your phone? Now you only press one button, the phone will ring and tell you where it is! To give you the double protection, note the tracker and mobile phone will beep if the tracker is beyond the preset range. When the mobile phone reconnects with the tracker, the phone will beep. When you’re waiting for your luggage in the airport, you can do anything you want while you’re waiting once your luggage appears, your phone will notify you. The app will record the location information and mark on the inbuilt map where the tracker disconnected with your phone just follow the location and find it back. Lost the connection with your belongings? Don’t worry our app will record the location, and all our app user scans functions will help to find it. When the user finds the missing item, the app will send the location information. 1. How far is the connection range between the phone and the patch? Outdoors it is approximately 50 meters, indoors iit s about 30 meters. Mini 1.4" Display GPS USB Rechargeable Keychain Nevigation Tracking System Handheld Compass Tracker GPS for Outdoor"
Oz GPS เครื่องติดตาม Tracker รุ่น TK103B (Black).